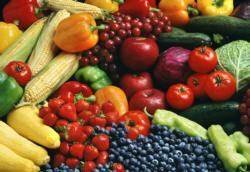 Providing consumers with nutritional information including fruits and vegetables. • Fruit and Vegetables - Web site of Diane M. Barrett, Ph.D., Fruit and Vegetables Products Specialist, Food Science & Technology, University of California, Davis. • Fruit & Nut Research & Information Center - University of California. Coordinates and disseminates research-based information, statewide research and extension activities related to fruit and nut crops. • UC Department of Nutrition - University of California, Davis. Extends science-based information through research that formulates policies, nutrition recommendations, and school garden and nutrition education programs. • Postharvest Technology Research and Information Center - Department of Plant Sciences, University of California, Davis. Information for California growers, shippers, marketers, retailers, and consumers of fresh horticultural crops. • Nutrition.gov - Easy, online access to government information on food and human nutrition for consumers. • Expanded Food & Nutrition Education Program - EFNEP is a federally-funded program that offers nutrition education to limited-resource families and children.